Hi everyone, welcome to my slayer guide where I’ll be discussing slayer rotations. There’s a fair amount of theory and discussion, but in terms of actual gameplay it will be quite simple. I will also be providing summaries and TLDR’s throughout the guide to make it more digestible. If you don’t want to read through tons of stuff, the TLDR section at the bottom has what you really need to know. Slayers, like most classes, already have a fairly intuitive list of abbreviations. For example, Heart Thrust = HT. I won’t be providing a list of the common abbreviations in this guide, as you should already be familiar enough with slayer skills. However, there are a few extra notations I need to mention just for clarity, listed below. > = Means “X chained into Y”. If X or Y are not specified, it means any valid skill. For example, >OHS means “any skill that can be chained into OHS, chained into OHS”. Or HT> means “HT chained into OHS or Evisc”. Note that sometimes this will be omitted such as in HT OHS or other combos. 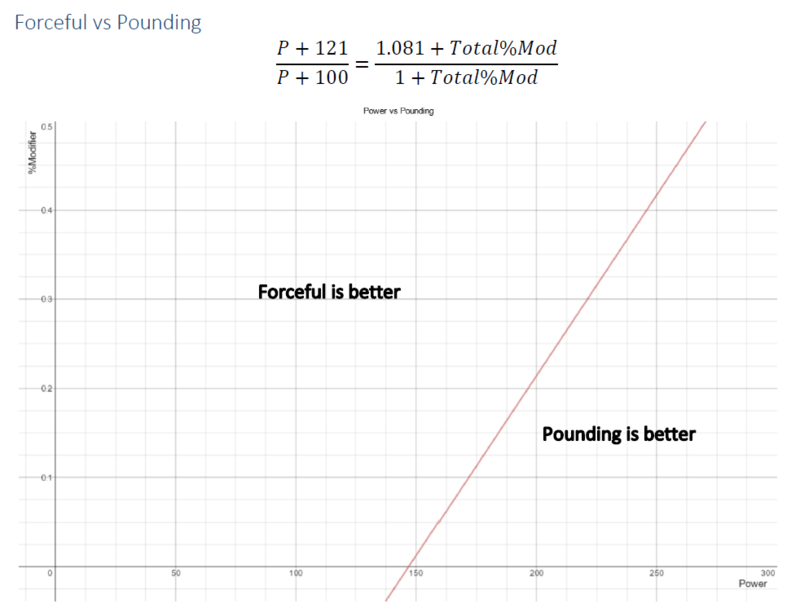 p = Means powerlinked. As with >, note that it may sometimes be omitted, as we can assume, for example, that any OHSs following Evisc are powerlinked. s = Means “skipped”. This means a skill cancelled BEFORE it hits. For example, sHT>OHS means you did HT OHS but only hit with the OHS. sOHS> would mean you skipped the OHS into the next skill. This may seem a strange thing to include right now but it becomes very important later. No need to reinvent the wheel. Bernkastel has already gone through these in his warrior and brawler guides to sufficient depth. You may read through the relevant sections in those guides or the summary here. There will be minor differences due to choice of values (such as boss crit resist) but the end result is more or less the same. Back time = 100%. Slayers should have no trouble keeping up almost 100% back time. For those wondering about BCSM (part of the full crit formula) we are ignoring that because it doesn’t apply to slayer as far as I know. Where CCB 1 and 2 refer to your crit chance before and after respectively. “ActualBaseDamage” is as the name suggests. This is supposed to be the “tooltip” damage but unfortunately many slayer skills have the wrong base damage listed. “Chestline” means the 10% OHS skill line on your chest. “Overpower10%” means the 10% glyph. Yes, it multiplies on the 33%. It isn’t 43% total. “Powerlink” is the sum of all Powerlink glyphs. “CritBoost” refers to the bonus potential damage the skill does due to crit sources. So let’s use HT as an example. The triple crit factor really just means +112 crit factor. Let’s assume we have 56+200 crit factor for now. So the scaled damage is 3377 * 1.3 * 1.25 = 5488. Essentially, this means that if you replaced HT with a skill that did 5488 damage with no glyphs, it would do the same DPS as a +200 crit HT. In this way, we can start to compare the skills that have crit glyphs. So now we’ve gone over the relevant formula, here is a table of slayer skill data at 30 FPS, +0 aspd, 300 total crit factor (56+244). It’s worth noting at this point that skills with extra crit sources generally scale worse with crit than those which don’t when talking about typical crit ranges. To show this visually, here is a graph showing the bonus damage offered by the MS triple chance and HT double factor glyphs. As you can see, the MS glyph at 200 crit factor increases MS damage by around 80%, while the HT glyph is around 30%. And, as your crit factor increases, the MS glyph drops off a lot quicker than the HT glyph. 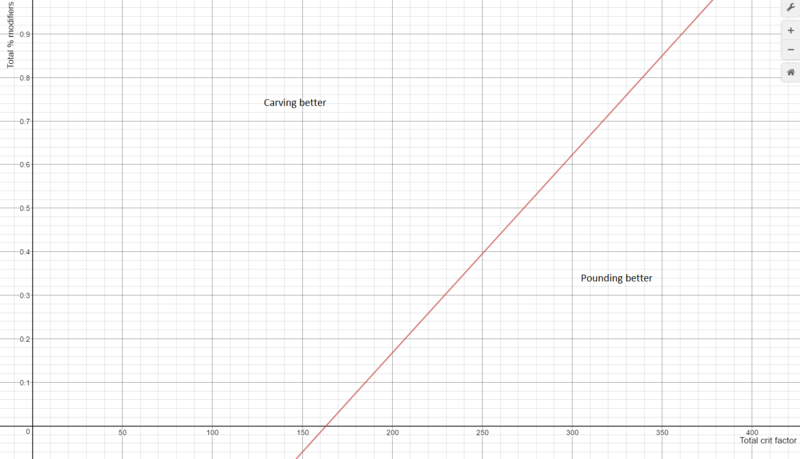 Obviously nobody is going to have 700 crit factor but the graph is extrapolated that far to show the trend. DPF means damage per frame. Since I recorded cast times in frames, we have DPF instead of DPS. MS is by FAR our best skill. Nothing else even comes close. It does 238 DPF and the next closest is >pOHS> at 190. Obviously, this means we should be focusing on hitting MS on cooldown. That being said, OP MS ALSO has 238 DPF. And if you look at the actual damage values, the OP is adding a massive 19341 – 12638 = 6703 damage. That is about 80% of an OP HT. On lower crit factors it would be even more. Obviously, OP MS is quite unconventional, but these numbers mean we will need to look into it further later on. Our fillers are a joke. SB (glyphed) for example only has 67 DPF. The main use of the fillers is to hit extra OHSs, but the fillers themselves are horrible. KDS is better than SB/Kick. FS at 100% hp is really bad. It also has longer casting time than 1/4th of WW. Therefore, the speedcast glyph is pointless. Fury+WW takes longer overall than WW itself and is a waste of mana and glyph points. So at this point it probably seems like a simple task to order everything by DPF and call it a day. Unfortunately, that’s not quite how slayer works. This is a technique where you cancel the cast time of your buffs (OP, ICB, tenacity, etc) with any chained skill (OHS, Evisc, MS). The chained skill will still be slowcast, but the buff will still apply. The benefits of such a simple technique are obvious, as it means you can apply buffs without really having to “pay” the full cast time. For example, OP takes 1 full second to cast at +0 aspd, but when cancelled only takes less than 1/3 of a second. Thus you can do OP Evisc in almost the same time as a normal Evisc. Unfortunately, though OP Evisc sounds really good, you will NOT be doing OP Evisc in this rotation unless you make a mistake or in fairly rare situations. That being said, this technique does allow us to change our rotation quite significantly. Routing is why we can’t just list by DPF. Essentially, due to the fact that most of slayer skills are chained or have an interaction with something else like OP, we can’t just list “highest to lowest DPF”. In many situations, it is actually better to use skills with less DPF, but more actual damage leading to higher overall DPS. For example, let’s take OP Evisc into consideration and talk about why it is not preferable to OP HT. Taking buff cancelling into account, OP Evisc> only takes 8+30 frames to cast, and deals 6385 damage. This is 6385/38 = 168 DPF. Let’s compare this to OP HT> which takes 30+34 frames to cast, and deals 8400 damage, for an overall 8400/64 = 131 DPF. Clearly, 165 > 131 and therefore OP Evisc trumps OP HT, correct? Unfortunately, no. The problem is that we haven’t considered these skills in the context of an actual slayer rotation. Let’s try looking at these 2 chains in a bigger view. OP HT>OHS>Evisc>OHS>MS vs HT>OHS OP Evisc>OHS>MS. Notice that in the OP HT rotation, the first OHS gets cancelled into Evisc. But in the second rotation, it is not. >OHS takes 40 frames to complete while >OHS> only takes 22. Therefore, NOT chaining out of OHS “costs” 18 frames. Add the 8 frames for a buff cancelled OP and you get 26 frames. On top of that, a double-chained Evisc takes 27 frames while a slow-cast takes 30. So add another 3 frames for not fast-casting Evisc and we have 29 frames. So in reality, OP effectively has the same cast time regardless of what you cast it on. Going back to those 2 rotations, they actually take roughly the same amount of time to complete. The table below shows what I mean. As you can see, OP Evisc is only 1 frame faster than OP HT over the course of a full string. So looking at OP Evisc in isolation is misleading. If we now consider OP Evisc> to actually be 29+27 frames, then the DPF is 6385/56 = 114. Lower than OP HT>. Thus we can see that simply listing things by DPF doesn’t quite solve slayer by itself. It is useful to check DPF, but you still need to consider the context of what you are comparing. We already eliminated OP Evisc, but now we have to think about OP MS vs OP HT. Obviously, OP MS is neither the intended nor intuitive rotation, but it has good numbers, and I would not be talking about it right now if it were not important. First we need to define what exactly we are comparing. I will first outline OP HT as it is what most people are familiar with. There are some variations (for example, some people double glyph OP) but this one is better at high crit values. Next I will outline what OP MS is. There are some further complexities to this rotation I need to go over later, but for now this is sufficient for comparison. As you can see, the two rotations are actually quite similar. Differences in what you use OP on. OP HT glyphs KDS and SB whereas OP MS glyphs OP. Using the skill data from earlier, we can compare the damage values (with 300 total crit factor) and cast times. For OP HT, this just means 30 frames. For OP MS, this means the frames lost on not cancelling OHS (18), the cast time for buff cancelled OP (8) and the cast time for sOHS (20). In total, this is 46 frames. Thus, OP MS is 16 frames “behind” OP HT. For OP HT, this is the damage gained from an unglyphed OP on HT. For OP MS, this is the damage gained from a glyphed OP on MS. This is 19342 – 12638 = 6703. The difference here is 6703 – 1755 = 4948 per OP in favour of OP MS.
Keep in mind that in real fights, OP HT rotations typically do not land OP HT on cooldown because the cooldowns do not line up. The OP HT “uptime” is more like 60~80%, while OP MS can always be done in sync. However, we will give OP HT the benefit of the doubt and pretend they have 100% OP HT uptime. OP HT also has OHS Powerlink, Empowered KDS and Empowered SB. KDS has a base cooldown of 8s, while MS has 10. Therefore, you can use KDS 1.25x more than MS and we will be multiplying the gains of the KDS glyphs by this much. Again, in reality this doesn’t happen because WW’s base cooldown is 10 and you want KDS to line up with that. Furthermore, KDS isn’t a top priority skill so you most likely won’t be hitting it on cooldown. But again, we are giving OP HT the benefit of the doubt. OHS Powerlink * 1.25 = (5035-4196) * 1.25 = 1049. Empowered KDS * 1.25 = 803 * 1.25 = 1004. SB has a 15 second cooldown compared to MS’s 10 and so can only be used 2/3 as much as MS. In reality you won’t actually be using SB on cooldown but again we are pretending we will. Empowered SB * 2/3 = 400 * 2/3 = 267. Total = 1049 + 1004 + 267 = 2320. OP MS takes 16 frames longer overall, but does 4948 – 2320 = 2628 more damage per “rotation” at least. For reference, this is 164 DPF. For an OP HT rotation to overcome this difference, it would need to consistently land an extra core skill every rotation. Given that most core skills are around 30~ frames to cast, and that the OP MS rotation is also trying to hit all these skills on cooldown, it is highly unlikely for the OP HT rotation to come out on top. Obviously, over the course of a fight, the 16 frame difference adds up and OP MS will “lose” some hits, but at that point it will have gained a large enough lead for missing hits to be irrelevant. In addition to all this, remember that we have made several concessions in favour of OP HT. To begin, we are using 300 crit factor values. 300 crit factor (or +244), is significantly higher than most people would have. A fully geared slayer with a +14 crit roll on weapon, double etching IIIs, 3/2 crit shadow accessory set, gold innerwear, and perfect rolls has 321 crit factor. With a mystic/food buffs it can be a lot higher, but at that point you are most likely considering stacking some more power rather than building more crit. Regardless, the vast majority of the population don’t have anywhere near 300 total crit rate. We have also assumed that OP HT is done “on cooldown”. This never happens in real situations. Prior to the cooldown buffs, slayers were only managing to cast OP on about 50% of their HTs. With the cooldown buffs, and a generous estimate we could make that 80%. Similarly, we have also assumed that KDS and SB are hit on cooldown. Again, KDS is usually synced with WW (which is 10s base cooldown) and even then usually is not used on cooldown in favour of core skills. SB typically is only used <5 times a fight. So what happens when we start to take all these points into account? Well, let’s tone down our total crit factor to 250, which is more representative of what an average player will have. The difference in damage due to OP is now 5912 (up from 4948), the KDS glyphs only amount to 839 and 803 respectively (if we assume KDS is being cast 1:1 compared with MS), and SB is basically non-existent. So overall, the damage differential is now 5912 – 839 – 803 = 4270. But what does this 4270 even mean? Well, if we assume it’s 4270 per MS, and we know roughly how much MS contributes to our overall DPS, then we can get a fairly good idea. MS in an OP HT rotation (at 250 crit factor) deals 13045 adjusted base damage, and generally contributes around 25% of your total DPS. This means an OP MS rotation would do 4270/13045 * 25% = about 8% increase in DPS. Meanwhile, the 2628 from earlier is around 5%. As an interesting side note, if your MS currently contributes around 25% of your total DPS, and OP roughly increases the adjusted damage of a skill by 1.6, then your MS would contribute around 40% of your total DPS. So OP MS is basically to slayers what scythe is to warriors. Interestingly, you can show similar results with DPS meters as well. Unfortunately, teradps.io doesn’t show how many times OP is used, but I have some data generously submitted to me prior to the patch. Each ID indicates 1 meter, and the data shows the damage contributions of HT and MS, as well as the number of OPs and HTs used (All were doing the traditional OP HT rotation as far as I know. They also double glyphed OP as it was meta for the time). MS/HT shows how much more MS contributed over HT (on average 1.2x more) and OP% shows how often HTs were OPed (on average 66%). Obviously, the numbers will be slightly different to now because of the patches. But it will still prove the same point. On average, HTs contributed about 18% total DPS, while MS contributed 21%, for a total of 39%. Additionally, OP is used about 2/3 as much as HT. So, we will assume that 66% of the HT damage was due to OP HT, and the remaining due to normal HT. Additionally, OP roughly increases the damage of a skill by about 1.6x. Hence, we can estimate the % contributions of HT and MS if an OP MS rotation were used. The contribution for normal HTs would be 0.34*18 + 0.66*18 / 1.6 = 13.5%. And the contribution for MS would be 21*1.6 = 33.6. Together, this is 47.1%. This is 8.1% more damage than before. Keep in mind we still haven’t accounted for the 16/24 extra frames it takes to cast OP MS. So the question now is 8.1% damage vs 16/24 frame loss. To put 8.1% damage into perspective, pre-patch OHS contributed about ~16% total damage. Thus we could say 8.1% is worth half your OHSs, or an equivalent combination of other skills. It is unlikely for you to “lose” half your OHSs just from switching to OP MS. It’s also worth noting that the number of MSs is typically less than half the number of OHSs, meaning you would need to lose more than 1 OHS per MS for OP HT to be better. In our current patch, the damage increase would be slightly higher. Not every skill got buffed as much as MS did and therefore casting OP on it would be even better than before. If you were to do the maths with your own meters, you would find similar results. A note on landing MS off cooldown. It is also important for us to acknowledge the flexibility of OP MS. Theoretically, MS should be landed on or close to cooldown in any slayer rotation. However, that isn’t always the case. 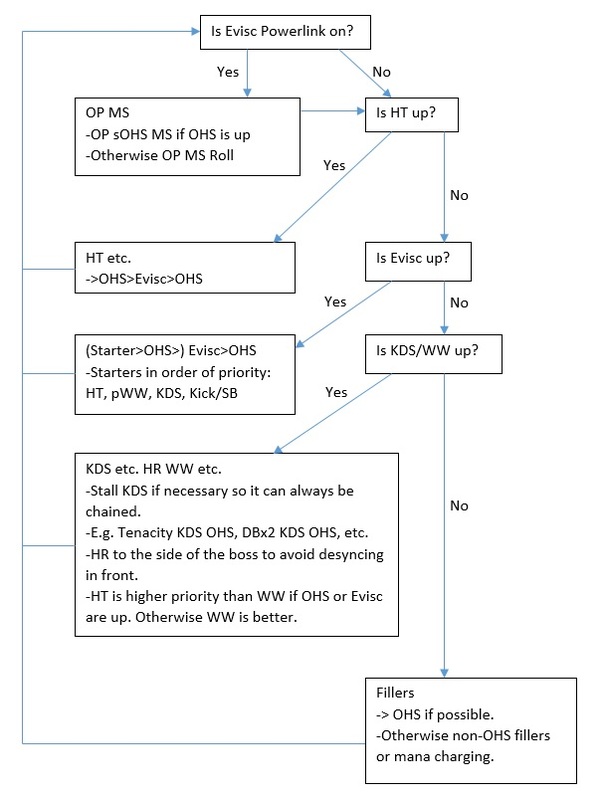 For example, with an OP HT rotation, you have to make sure you have an OHS or Evisc up for your upcoming MS. You also have to worry about what happens if the boss turns just before your MS. You have to roll through, use another starter, another OHS/Evisc (which you might not have), then MS.
With OP MS, it is much simpler. When OHS is not available, you can do OP MS Roll (yes slowcast MS). This is overall about 8 frames slower than OP sOHS MS, but doesn’t require your OHS to be up. Furthermore, if the boss does turn, you can simply roll through and try again. In addition, you can practically always land OP MS where you could otherwise land a normal MS. The quickest normal MS chain is Evisc>MS, which takes 30+26 = 56 frames for the MS to hit. An OHS chain such as HT>OHS>MS would take 34+22+26 = 82 frames to hit. In comparison, OP sOHS>MS takes 8+20+26 = 54 frames to hit. OP MS Roll takes 8+53 = 61 frames to hit. So overall, the OP MS rotation lands MSs more consistently with less thought required. You don’t have to worry about lining up OHS/Evisc cooldowns for MS, you just do it on cooldown. One downside to doing OP MS is that a roll is used whenever you perform OP MS Roll. However, I will argue that this is fairly insignificant when you consider the sequence of events required for you to actually be punished for 1 less roll. To begin, OHS is on cooldown. (40% chance). The boss then needs to burn both your backstab and your other roll within 4 seconds (so both iframes are on cooldown). 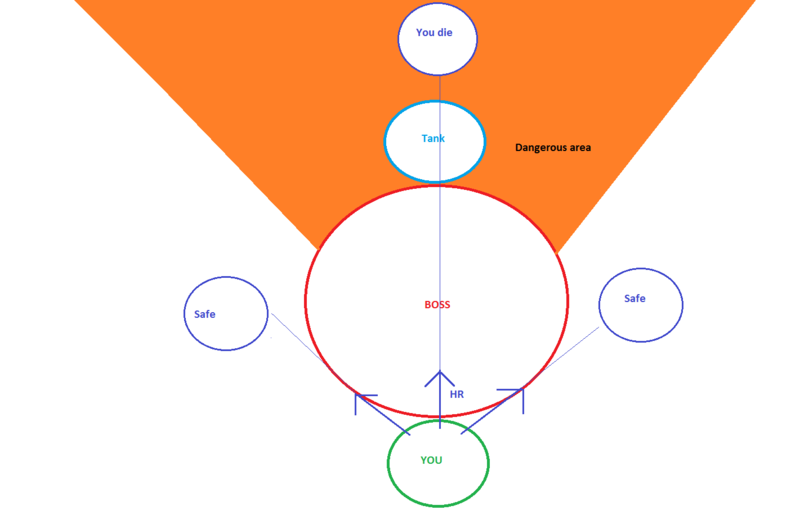 The boss then needs to hit you with a oneshot that you did not see coming and cannot escape with other skills before roll comes back off cooldown. So you would need to perform OP MS Roll (which is expected once per 21.25s) and the boss will need to attack you with at least 3 skills that you cannot otherwise avoid. I find it hard to believe that this is a common occurrence at all, especially considering that most one-shots are heavily telegraphed or on timers so you should know when they are coming. Also keep in mind that several classes (such as healers, zerker, etc) still have less iframes than you do, and oneshots are typically not blockable. These classes are still expected to clear runs without dying. Fillers that don’t go into OHS / mana charging. But there’s still a few things I would like to discuss for optimization. OP has an 8 second cooldown, but a 20 second duration. This means you can cast it 8s before the battle starts, have OP charged on your first HT, then cast OP again for MS. It is better to go for OHS>Evisc>OHS because double OHS is 1+0.6*1.25 = 1.75 OHS on average, while single OHS is only 1.25. As mentioned before, when you can’t do OP sOHS MS you can do OP MS Roll instead. When rolling, think about where you want to roll. Most of the time, through the boss to the front is not a great idea because you will die. Backwards (ie, towards your screen) is generally the best option, because this puts you outside range of most random attacks, and you can recover the distance with KDS, HT, HR WW, etc. Due to the long cast time of OP MS, OHS will always be up in time for your next skill. For example, if you do HT OHS OP sOHS MS HT, OHS will be up for the HT to chain again. Sometimes, you won’t have OHS or Evisc up for KDS to chain into. In those situations, do NOT do a full-cast KDS. In fact, you should never have to do a full-cast KDS. It is always better to “stall” your KDS with fillers such as DBx2 into KDS. You can also do AAx2, mana buffs, or even DBx3 if your ping and aspd are good enough. (Going back to the DPF discussion from earlier, this is another instance where the highest DPF skill, KDS, is not the best option). The second chain takes 188 frames if we assume the WW is cancelling into an OHS or Evisc (OHS if it resets, otherwise Evisc should come up around the 2nd hit of your WW. Unless you have high aspd with very low ping. In these cases, you can try doing DBx3 instead). So, the second chain is better because on top of the extra damage from DB (or whatever you put as filler), you will also get an extra OHS reset chance. And here is a visual representation. It is roughly to scale. If MS comes off cooldown during your KDS, just do OP MS then WW after. If HT comes off cooldown during your KDS, it depends on if you have OHS up. In other words, if OHS resets, you should do HT OHS. If OHS does not reset, WW is better. If HT and OHS constantly reset together, then you just don’t do WW at all. And obviously if HT isn’t up but OHS is, then do WW OHS. WW Powerlink adds about 1400 damage. KDS empowered adds about 800 damage. Thus, WW Powerlink is better if you can make use of the Powerlink over 55%~ of the time. (The exact damages and % will vary slightly depending on your crit factor). In personal testing, this has been easily achievable. 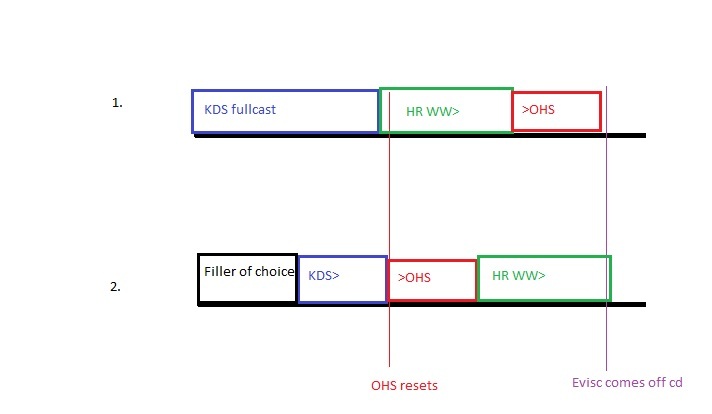 You have an 8s window to use WW after KDS, so you can even do other strings before going into HR WW. With +30 aspd (including healer buff) and good ping, you can even do KDS OHS Evisc OHS OP sOHS MS HR pWW. If you have higher ping, you might need extra aspd (eg bravery) to make it more consistent. But outside of the long strings you should be able to fairly comfortably land WW. The only time you definitely won’t be able to is long boss mechanics. However, if there is a specific boss you find it hard to manage >55% on, or you want to save your HR for something, feel free to take another glyph. For those of you who are uncomfortable with HR WW due to it desyncing you through the boss, there’s actually a very simple solution. HR to the side of the boss. You’ll desync out the side which is generally a fairly safe place to be. Just remember to turn your camera forwards again before pressing WW so you get that backcrit. Autos, Mana charging. (Depending on your mana and upcoming skills). Fillers can be quite flexible depending on the situation. To begin, make sure HT, Evisc and MS are on cooldown before you even think about using fillers. As detailed in the previous section, a filler could be used prior to KDS (and thus also WW) to stall KDS for better overall DPS. Next, you should also keep in mind that anything with OHS beats anything without OHS. For example, Leap>OHS is better than DBs. If OHS is up, use it. Also, your autos and mana charge skills (shout, tenacity) are just there for maintaining mana. They will vary in priority depending on the situation. If you have ICB coming up, or core skills like MS, HT, Evisc, etc, make sure you have the mana to do them, even if it means not doing SB etc. Also, if you are running glistenings, make sure you are facing towards the boss when you auto, or else the glistenings won’t proc. Finally, consider the situation when picking your fillers. What I’ve listed above are ONLY from a DPS perspective. For example, sometimes you might find it useful to do Kick>OHS instead of other fillers because Kick moves you far enough to dodge many boss moves. Or, if you get stuck inside the boss, Kick can help “push” you out instead of rolling (which does 0 DPS). There are also cases where you might not want to do Kick (if it will put you somewhere dangerous) if you’re low on health. There are many situations where the filler priority can change, and it just comes down to your experience with the boss/dungeon. Before getting into ICB rotations, I would like to clarify ICB mechanics first. As stated in the tooltip, ICB provides 29 power and 8% aspd for 20 seconds. ICB activates (and the 20 seconds begin from) frame 7, and the total cast time for ICB is 44 frames. ICB is a buff and therefore can be buff cancelled. By cancelling ICB, you can save 44-7 = 37 frames. (Around 1 second). Cooldowns for HT, WW, KDS are reset. OHS becomes UOHS. UOHS has significantly more range, a bonus damage multiplier, zero cooldown, and cool electricity effects. However, UOHS does NOT benefit from powerlinks, chest skill line, and so on. It is a different skill to OHS. The UOHS bonus damage is where things get weird. On activation of ICB, a random damage multiplier is rolled. The multiplier does not change during an ICB. IE, it only rerolls per ICB activation. +20%, +50%, +75%, +100%, +125%, +150%, +175%, +200% and +225%. Note these are not “total” multipliers. +20% does not mean your UOHS literally does 20% more damage than your normal OHS. Instead, these are multipliers on the base OHS damage (2504). The total white damage will also be altered by the ICB 29 power. In other words, UOHS can actually deal less damage than normal OHS if you roll a +20% multiplier. (The chestline and Evisc Powerlink gives your normal OHS 1.1 * 1.25 = 1.375x damage). On the other hand, a +225% roll can mean your UOHS now does higher DPF than MS.
From testing, you do NOT have an equal chance of rolling each value. It seems that each mob has a different chance of rolling different values. Re-logging, porting, changing buffs, etc appear to have no effect on what multiplier you roll. Due to the varying multipliers you can roll, there are several different ICB rotations possible. This is the traditional ICB rotation. You pop ICB, and you aim to land as many OHSs as possible. Always begin with ICB Evisc>OHS etc. As mentioned above, ICB has cast time, and you don’t want to waste any of your precious 20 seconds in animation lock. Evisc will allow you to cancel your ICB animation and go straight into DPSing. Don’t do OP ICB HT because OP+ICB is 2 seconds spent doing nothing. Don’t OP HT because you will end up doing less OHSs. Extra OHSs do more damage than you can get off OP HT. The priority list is essentially the same as outside of ICB. KDS is worth HITTING because KDS+OHS does more DPS than skipped KDS OHS on repeat. WW is still worth using, but if you RNG a high multiplier you can cancel after the first hit into an UOHS if you think it will net you an extra UOHS over the ICB duration. This is basically the same as OP MS outside of ICB. Again, you begin with ICB Evisc OHS, then follow up with OP sOHS MS. In general, you do 1 less OHS for each OP MS you do. Therefore, whether or not this rotation does more DPS depends on which multiplier you roll. Using 300 crit factor values, OP on MS adds about 6703 damage. This is about equivalent to a +120% damage OHS. Therefore, if you rolled any multiplier that is +100% or lower, this rotation is superior compared to rotation 1. This is maximising MS taken to the extreme. Start with OP ICB sOHS>MS (with Powerlink up) and proceed to cast OP MS on cooldown. Done properly, this will allow you to fit in 3 OP MS in 1 ICB. (Other rotations hit a maximum of 2 MS per ICB). That being said, you do not “gain” an extra MS. In the other rotations, the “third” MS is outside the ICB. Damage-wise, this rotation is superior to rotation 2 because you have applied the ICB power buff on 3 MSs compared to 2, therefore squeezing out a bit of extra damage. In terms of cast time investment, this is actually the same as rotation 2 despite full-casting OP. Like the OP Evisc discussion earlier, this is because rotation 2 “spends” 8 frames on the buff cancelled OP, 18 frames on not cancelling something with Evisc, and 3 frames for slow-casting Evisc for a total of 29 frames. So overall, rotation 3 deals slightly more DPS than rotation 2. However, the downside of this rotation is that the timing is strict. You need to do the MSs asap or ICB will run out before the 3rd one. Having extra sources of aspd (such as braveries) or cdr will help if you have difficulty landing this rotation. Compared to rotation 1, you are still losing 1 UOHS per OP MS so the threshold is still the same as rotation 2. It depends on your luck. If you notice your UOHS hitting really hard, focus on maximising OHS. If you feel it’s hitting really low, focus on OP MS. In theory, you could figure out exactly which multiplier you rolled as soon as you hit the first UOHS. However, this isn’t very practical as your actual damage values can vary due to buffs/debuffs, enrage, etc. Furthermore, since powerlinks and chest lines don’t count on UOHS, a +100% multiplier doesn’t actually show up as double damage. Given that a “normal” OHS is already 1.375x damage, 2x damage in reality looks like 2x / 1.375x = 1.45x damage. So a +100% multiplier is a +45% “true” multiplier. Aka don’t heal me pls. The damage table for FS is shown below. Don’t ever use this on 100% HP. It does crap damage and costs too much mana. On 90% it’s only worth using if you don’t have OHS up. With OHS up, other fillers (like SB/Kick) are better and don’t cost as much mana. Under 80% or 70% is around when it becomes about equivalent to a KDS. KDS is still better because it chains into OHS and powerlinks WW, but FS can be good as a filler.In regards to glyphing it, it is only worth glyphing for a slaying build. In theory, it can be worth glyphing at ranges as high as <70% HP, but only if you’re consistently staying at that HP range or lower. And if you are, you might as well stay at <50% instead. Thus, when looking at FS glyphs we are going to assume you are on <50% HP. Together, Roll Powerlink and FS empowered cost 7 points. Our glyph build is currently 54/55, and so we need to find our weakest 6+ points. Keep in mind that glyphs on the same thing synergize so values can vary slightly when we are talking about taking off 1 glyph alone vs taking 2 glyphs off that buff the same skill. KDS Powerlink is 3 points for 25% damage on WW. This is equivalent to 1434 damage every 10 seconds (HR cooldown) assuming WW is glyphed for triple factor. WW carving is 4 points for triple crit. This is equivalent to 1251 damage every 10 seconds assuming WW is powerlinked. Note that this is LESS than the KDS Powerlink. However, if your crit is ~250 they are about equal. Together, KDS Powerlink and WW crit are worth 2435 damage every 10 seconds. Evisc empowered is 3 points for +25% damage. This is equivalent to 787 damage every 6.8 seconds (nostrum+cdr glyph), which is 1157 damage every 10 seconds. Evisc CDR is 4 points for 20% CDR. This is equivalent to 25% damage if you use Evisc on cd with the empowered glyph. Together, the Evisc glyphs are worth 1771 damage every 8.5s, which is 2083 damage every 10s. Thus, our weakest 6+ points are actually both Evisc glyphs, assuming you are able to use KDS and WW on cd. If you are not able to (eg super spastic boss) then KDS and WW will be your weakest glyphs. Roll Powerlink is 4 points for 25% damage on 50% HP FS. This is equivalent to 1147 damage every 8.5s, or 1350 per 10. FS empowered is 3 points for 40% damage on 50% HP FS. This is 1639 per 8.5, or 1929 per 10 with the roll Powerlink. Together, the FS glyphs add 2459 per 8.5, or 2892 per 10. Note that on the 40-50% range, KDS Powerlink actually adds slightly more damage than roll Powerlink. However, under 40% roll Powerlink is better. Finally, some may have noticed that I’m not including OP in these damage calculations. That’s because we won’t be doing OP FS. Yup, we’re still doing OP MS. This is because OP MS will always do more expected damage than OP FS, especially because our crit multiplier is now 9.5x~ due to slaying crystal, which scales better with MS than FS. In theory, at <10% health and super high crit factors it could be more beneficial to do normal MS + OP FS. However, for the vast majority of cases, you will usually do more overall damage with OP MS + FS. Plus it wouldn’t require you to change any muscle memory. So fitting it into our rotation is simple. Remember that Roll-cancelling a fastcast MS doesn’t change its total cast-time, and you’re already rolling anyway in the 2nd variant. Therefore, rolling at these points costs you no extra cast time compared to your normal rotation. Also, both FS and MS have base 10s cd, so you can always do these skills together. If you try to roll FS at any other time, you will be spending time on rolling you could have instead spent on other skills. Savage, Focused, Bitter are must-haves. Glistening, Carving, Forceful and Pounding are the options we shall consider for the 4th slot. First off, having enough mana is more important than anything else. If you don’t have glistening dyads, mana pots, or other significant sources of mana, glistening niveot is your best choice. Having 3% crit chance, 20 power, or 8% damage doesn’t matter if you’re spending half the time charging mana. A dedicated healer (or even 2) might be able to keep up, but chances are if you don’t already have dyads or mana pots, you also won’t have a static. Add up your stats for both sides, and find where you are on the graph. Basically, for poorly geared slayers carving will be better, while for well geared slayers pounding will be better. That being said, if you’re poorly geared you probably won’t have dyads, mana pots or a dedicated healer, in which case you should be considering glistening. Keep in mind that ICB grants you 29 power, so if you get a borderline result, pounding tends to be better. Do this rotation. Compared to OP HT, it does more DPS, takes less thinking and is more flexible. 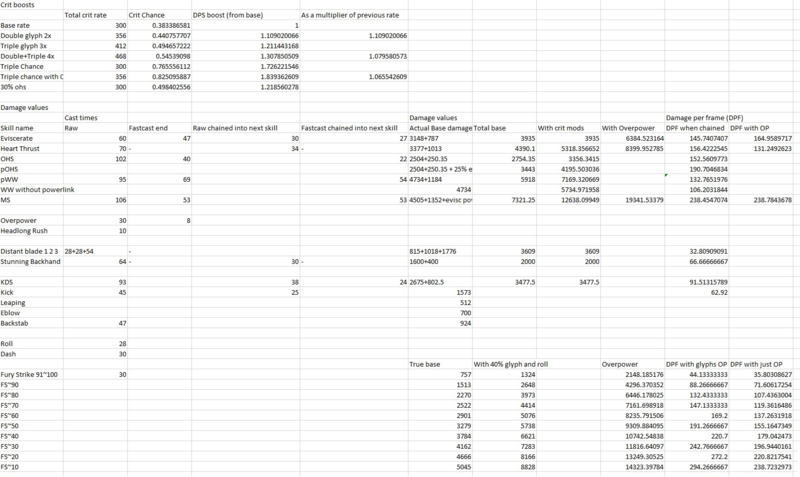 With ICB, you can either focus on maximising OHS or OP MS depending on how high a multiplier you rolled. http://www.essentialmana.com/glyph-calc/#sl65:a3:c2:d1:h4:n4:p123:r23:u23:v15 if you believe you can land KDS + WW consistently. http://www.essentialmana.com/glyph-calc/#sl65:a3:h4:n4:p123:r23:u23:v1256 if you don’t think you can fit KDS + WW in at all. You can also take a combination of Evisc + WW glyphs if you think you have space for WW but not KDS. In general, you shouldn’t have much trouble with the first build unless it’s a really spastic boss. As for the rotation you just add Roll + Fury onto the end of every OP MS. So that’s it for slayer rotations. Even though this seems like a lot of detail, it’s pretty simple to execute in practice. Keep in mind you still have to adjust for your ping/aspd, and perhaps some ultra-rare situations I haven’t gone over. If you have any questions or you feel I missed something out, feel free to contact me ingame at Chs on TR, reddit or forums.